VERY LIMITED EDITION of DoaMSGG NOW AVAILABLE! 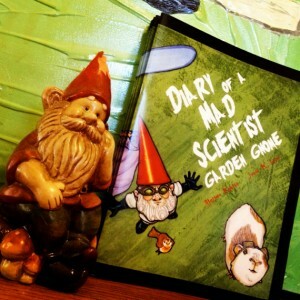 Just what it says up there: Janet Lee and I had a very limited number of the very first edition of Diary of a Mad Scientist Garden Gnome available at Comic Book City Con in Greensboro in October. This edition was a trial run — we plan to repeat this same format on future editions, but we will be using a different publishing method. The rest of the books we had left after the convention are now available via Janet’s Etsy Site HERE. As a bonus, Janet will be signing and numbering every one. I am seriously not kidding when I say get them now, because they WILL go fast, and there will not be any more available until we find a better publishing/printing model. “In a world where monsters and fairies roam the backyard, one gnome seeks to save his true love from an experiment gone terribly awry! This entry was written by Princess Alethea and posted on January 4, 2014 at 9:14 pm and filed under Books. Bookmark the permalink. Follow any comments here with the RSS feed for this post.